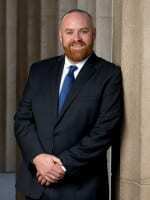 Ryan D. O’Neal is an associate attorney in the DeConcini McDonald Yetwin & Lacy, P.C. Tucson office. Mr. O’Neal earned his Juris Doctorate from the University of Arizona, James E. Rogers College of Law in 2014. He began his legal career as Law Clerk to the Honorable Catherine Woods of the Pima County Superior Court. Ryan has also served as Rule 38(d) limited practice prosecutor for the City of Tucson Prosecutor’s Office, as well as a Criminal Law Clerk for the Pima County Attorney’s Office. Mr. O’Neal demonstrated his community stewardship through work with Legal Aid Volunteer Lawyers Program and the Humanos Derechos Abuse Clinic. While a student at Arizona State University, Ryan was a Founding Member and Treasurer for Students For Substance Abuse Outreach.